Councillor Steve Brown (left), chairing the Town Council’s Seniors Coordinating Committee, advised the meeting from the chair that a funding application is in the pipeline for a retirement village at White Gums. This was a clear case of conflict of interest, argued Cr Eli Melky (right) at last night’s council meeting, and wanted to know how it could have gone unchallenged. Cr Brown was absent from the council meeting due to personal commitments. Cr Melky signalled that he would be raising the matter again at the end of month meeting. Cr Brown’s statement was recorded in the minutes of the Seniors meeting, referring to business arising from previous minutes and under the heading “Housing for Self-funded Retirees Survey”. CEO Rex Mooney, who was present at the Seniors meeting, said that Cr Brown had made the statement without further commentary from him or anyone else and the meeting had moved on. Cr Brown rejects Cr Melky’s comment as “nothing more than grandstanding of the sort we’ve come to expect from him”. When the Alice Springs News Online contacted him this morning, Cr Brown said the intention of council’s survey was to attract – “in the public interest” – retirement village packages and he had referred to the White Gums application as an example of this. He said the application has not even had approval yet – it comes before the Development Consent Authority tomorrow. He said he had nothing to gain from mentioning it, it was merely a matter of public information and therefore no conflict of interest exists. The Town Council may establish a tree farm inside a secure enclosure at Albrecht Oval for growing street trees to greater maturity before planting. The move is aimed at combating the loss of up to half of all street trees planted due to vandalism in the main (30%) but also to environmental factors, shock and theft. Left: Vulnerable young tree in Hartley Street. Tree guards have since been added. Photo from our archive. 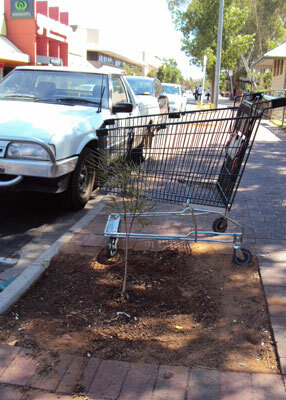 Council’s experience is that planting trees greater than three metres in height protects them from vandalism and theft. As well, growing them to maturity in local environmental conditions will increase their chance of survival. There is already a turf farm at Albrecht Oval where the tree farm is likely to be located. At last night’s committee meeting the proposal was positively received by councillors, although Cr Eli Melky challenged the suggestion that it would have nil financial impact in council’s budget. Councillors asked for more information in this regard. Councillors did not discuss an application by the Alice Springs Cinema for a seven-day a week liquor licence for on premise trading. The recommendation from officers was that council not object (this is a default recommendation) and as no-one demurred that will be the position conveyed to NT Gambling and Licensing Services. The cinema wants to be able to sell alcohol to patrons for one hour prior to and thirty minutes after the session time printed on a valid ticket, between noon and midnight. Right: Liquor was sold at the Sydney Travelling Film Festival held at Alice Springs Cinema for the first time this year. The liquor sold will be: beer in cans and bottles; cider in bottles; wine and sparkling wine by the glass; pre-mixed drinks in single-serve bottles; and for “gold class” and special events only, wine by the bottle and spirits and cocktails. 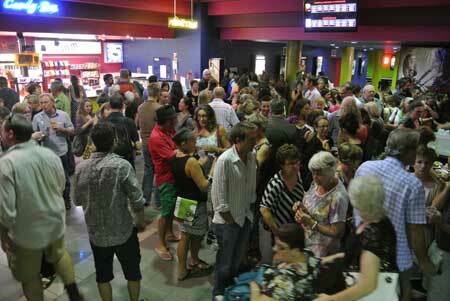 The application says that the cinema will take a phased approach to its alcohol sales. In phase one, drinks will only be available at special events. In phase two, to be implemented “mid to late 2014”, alcohol will be available to all patrons at all sessions except where restrictions apply, including no sales for patrons of children’s and family movies. Phase three – the gold class service – will be introduced in late 2014. It will offer table-type service for special gold class seats, including snacks, meals and desserts, and a small lounge area for gold class customers prior to the movie. Comments on the application are due by COB 24 August. Well said Janet. Someone needs to explain the substancial flow-on effects that purchasing locally has to who ever is advising our elected members. They all need to remember that with out local business there will be no future growth or employment for our future generations. Buy local and the benefits will flow to all. We have Tony at Ilparpa nursery who has spent years involved in native plants. Geoff Myers and more that I am unaware of more than likely. Council going into commercial operation against businesses already established here is a very bad move. Council has for too long been obtaining skills and equipment and products outside of Alice without investigating what we have here. The rubbish bins for the streets. We have businesses to provide bins in Alice. We have nurseries already established. Skills or products that cannot be sourced in Alice that is except able. But time Council directors look in our back yard first. And not waste monies on impacting on private business in Alice Springs. The grown-ups are in charge of the council. Big fish in a very, very, very small pond. Take your bat and ball and go home and sulk. Council should concentrate on providing the services that they are there for. They should arrange a deal with a local tree supplier, or call a tender for the supply of trees. Who knows the successful contractor might even be a “rate payer” who employs local people who may also be “rate payers”. This same policy could even be applied to the supply of rubbish bins and bike racks for the mall. Local rate paying employers should always be given preference over the non contributing alternative. Steve. I didn’t say anything about a funding application. I stand by that. As an elected councillor you should not be promoting or giving the appearance of promoting your own business interests in any council meeting. Are you really disputing that? No mistake Observer it was my absolute intention to pass on some moral boosting news about a possible positive outcome that the committee had been seeking! Just as I stated in my previous comment. Talking about mistakes Observer, the Council’s Senior’s Committee does not deal with funding applications or for that matter funding of any kind! Further and even more to the point there is “NO Funding Application” involved neither was I talking about one! We at white Gums are free enterprise! Do you even understand what that means I wonder, the application being referred to was a “Development Application” which if approved we have to fund ourselves, unless your offering of course! The intention of council’s survey was to attract – “in the public interest” – retirement village packages and he (Steve Brown) had referred to the White Gums application as an example of this (when he) advised the meeting from the chair that a funding application is in the pipeline for a retirement village at White Gums. This does look like an attempt by Steve to promote his own White Gums proposal. That’s not on. If this was unintentional and heedless of the consequences Steve should simply say that. Everyone makes mistakes. Playing lawyer and lashing out at Melky is unhelpful. Rereading this article reminds me just how much time is wasted at Council meetings dealing with Councillor Melky’s childish political antics. They have increased two fold since his stunning born again appearance as a PUP Party Member, unless however his seeming inability to grasp even the most basic of concepts has reached a dizzying new height. Councillor Melky must be aware that there is no conflict in this case, which in my view would make this just another bout of Melky mischief making. It’s also just a bit rich coming from a bloke that has the audacity to claim every month on his report to Council of Community Service, sport promotions on his clearly badged, heavily advertised Sports show, as a Community Service! Surely the intention of the service it provides is to promote Councillor Melky’s business isn’t it? A person should declare a conflict of interest and is indeed required to do so by law when subject matter upon which a decision is to be made will in some way or other benefit them or their immediate family. This is clearly not so in my commentary to the Seniors Committee! No decision was being made! No actions Taken! Nothing sold or brought! Nothing recommended! It was simply a bit of publicly available information about a “possible” upcoming project passed on to the committee as an encouragement! To demonstrate that their efforts in putting together a community survey that was conceived with the direct intention of attracting such projects, was appreciated and being put to good use, by some of us at least. Along with the congrats for efforts I also hoped I was instilling a bit of hope that options for retirees in the Alice were looking up, this was in answer to a bit of negativity that had been previously expressed by some seniors who were of the opinion that leaving town was their only option when searching for a certain level of facility. If talking up the town is a conflict of interest then I will happily declare myself in conflict and go right on doing it. I would also actively encourage Councillor Melky to do the same, spend a little less time on schemes contrived to shine the media spotlight on his personal profile and a lot more time on talking up the community, without any business badging! Err, on second thoughts, a lot less talking full stop would probably, in my opinion anyway, be more appreciated by a Melky voice fatigued community. The council are looking to spend more money on infrastructure (new nursery) that could be better served with existing local commercial nurseries and at an overall cheaper cost. I wonder when the council is going to explain where the NT Government Grant for $750,000.00 went for street tree planting on Council Roads. Where are the trees that were supposed to be guaranteed after two years? Well it’s been over three years since that grant was given and the result is a flat fail. Why would we want to allow Council to further complicate their duties when there is already so much they should be doing that form part of the their existing core duties?